Life has been hectic since I left the Divide. I'm currently in the middle of making the long commute between Salt Lake City and Juneau, Alaska. I had hoped to take the ferry, but I couldn't really plan my trip before I finished the ride, and the next boat was booked. I don't have the time to wait another week. So I have to make the 2,700-mile trip by myself in a 1996 Geo Prism. There's something about it that's very Divide-esque. It's even the same distance. Endurance driving. 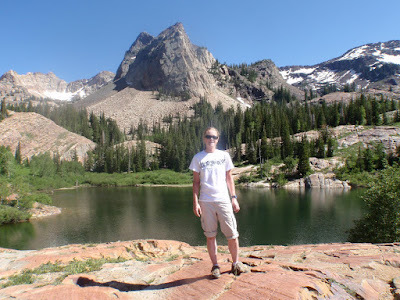 I'm even visiting many of the same places I passed through on the Great Divide. So far, this trip hasn't flowed nearly as well as a typical day on the bike. I left my grandparents' house in Roy, Utah, on Friday just before noon and did a bit of a killer day to Lethbridge, Alberta, to give myself time to visit my friends and enjoy one semi-day of rest in Banff. I stopped in Idaho Falls to visit former coworkers, but no one was around at the office. Then I made my first gas stop in Lima, Montana, and the little store where I once bought cheese curds (those were such a rare find on the Divide and so delicious) was all out of fountain Diet Pepsi. I took a wrong turn in Butte and ended up driving 10 miles on I-90, which is actually quite funny because the Great Divide route comes right down I-15. You think I would have wondered why nothing looked familiar. I blew through Basin and Helena. The sun was still up when I passed through Great Falls, so I decided to continue north, only to discover that the only hotel before the border (a casino) was all booked up. My car was searched at the border - the first time I've been searched in several dozen Canadian border crossings. I arrived in Lethbridge after midnight, completely hammered, only to see huge crowds of people lining the street like they were waiting for some kind of parade, and every hotel in town had their "No Vacancy" signs lit. It was so foreign to me. I never had trouble finding beds on the Divide. I continued to the next town - I think it was Macleod - and crashed out in my car in the parking lot of a gas station. 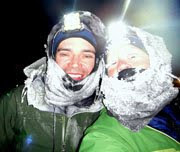 I slept only a couple hours before continuing on to Banff, wondering why life off the bike was so hard. It's been good, too. 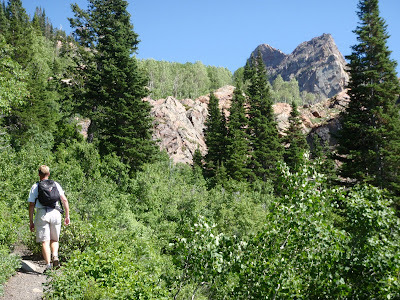 On Thursday I was able to get in one last hike with my dad to Lake Blanche - about 2,700 feet of elevation gain and seven miles - not bad for three days off the Divide. I'm still noticing that I have no high throttle when I need to power up something steep, even on foot. I compare it to my Geo, who on every hill just doesn't have enough oomph to keep the speed steady and begins slowing to a put-put-put. The Divide has turned me into an old car, but I still feel healthy and seem to have all the ability I need to power myself where I need to go. I hope my Geo can do the same. I'm sad to be leaving Utah. It's such a beautiful state and most of my friends and family live there. But Alaska beckons, as does my need to start bringing in income after three months of hemorrhaging my savings. One nice thing about my failure to find a hotel room last night is that I made it to Banff really early today. 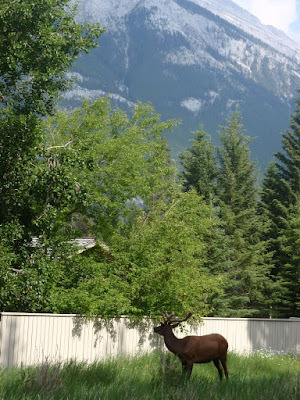 I enjoyed a leisurely walk and an ice cream cone among the throngs of tourists that visit Banff on a Saturday in July. I went to see the Spray River trailhead (beginning of the GDMBR). It's strange to be back here. It feels like no time at all has passed since I rolled out on June 12, but in many ways it feels like eons have passed. 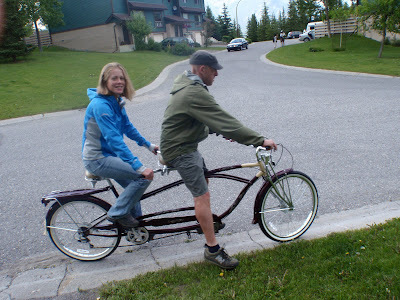 Keith and Leslie, who declared their place my "home" for the time being since I am currently homeless, led me on my victory tour through Banff - on a tandem cruiser, of course, through a current of tourists. 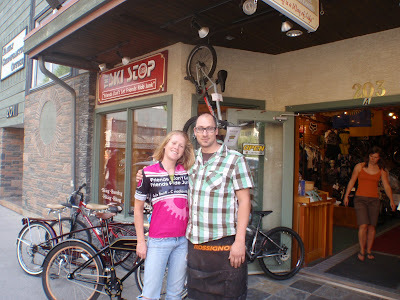 We rolled by the Ski Stop, a bike shop in Banff that threw a barbecue for the Tour Divide the night before the race. I guess as a TD finisher, I get to enjoy partial celebrity status. The owner, Jason, gave me a jersey, and supposedly this picture is going to end up hanging somewhere in the store. I'm heading out tomorrow for more endurance driving. Keith is going to accompany for about 60 miles before I drop him off for a road bike ride, and then it's back to listening to every single Tour Divide call-in on my iPod. North to the future! best of luck on your trip home.. ! Wonderful posts from your tour, beautiful photos. What you said about life on the bike being easier than real life is so true. Nicely put. I love reading up on your divide ride. Keep up the great work. Hope you love the mtb cast call-ins as much as I did. Eyes on the road two hands on the wheel! God I love a good road trip. WOW! You are like the Biking Blog Goddess or something. Pictures and stories like these never get old...Makes my day to visit. The book/s are on my Christmas wish list. Y'know Jill...if you would have just finished off the GDT a bit faster...you'd have had more time to visit in Banff. Don't be such a slacker next time and push it a bit, eh? Congrats on your fine, fine finish! 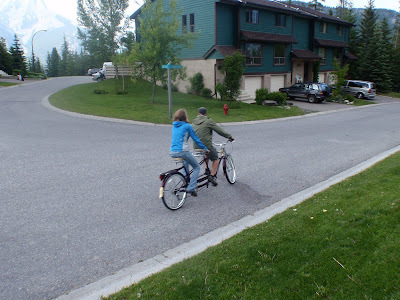 Also, loving the contrast of tandem bike w/bouncey seat vs. your mtn bike. Can't wait to hear/see more of your tales.